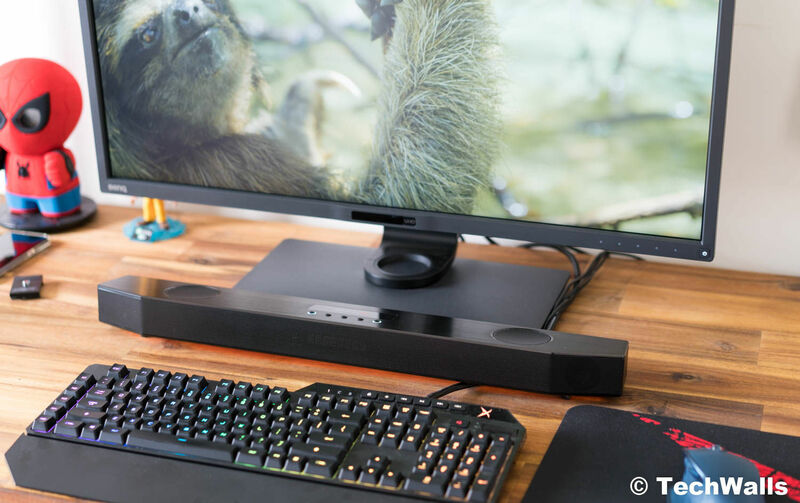 Creative Sound BlasterX Katana Gaming Soundbar Review - Pro-Gamer Approved? 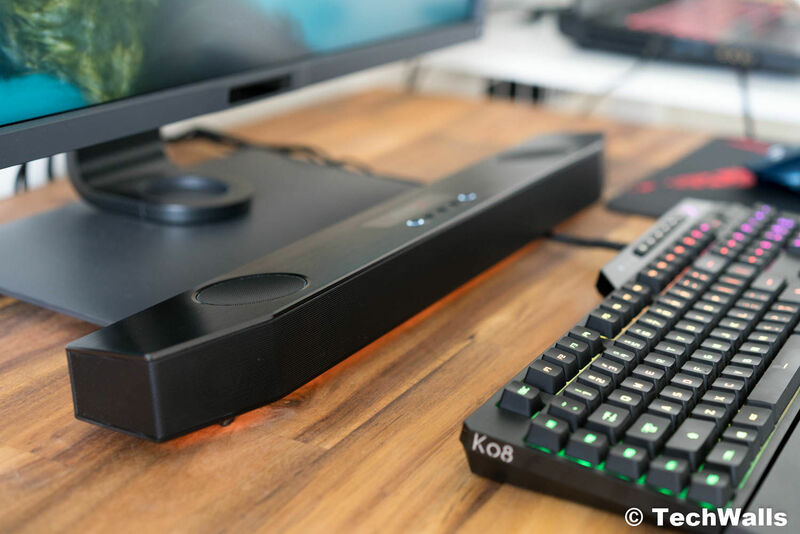 Creative Sound BlasterX Katana Gaming Soundbar Review – Pro-Gamer Approved? 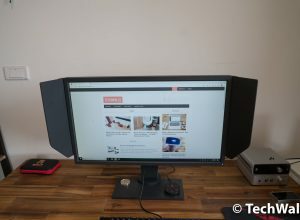 Soundbars for computers is not a new idea since many manufacturers release their products and they are well adopted by users. I actually tried a cheap soundbar with good Amazon ratings last year but it couldn’t stay on my desk for more than a week. The new Creative Sound BlasterX Katana is a much more premium product and it is among the most expensive gaming soundbars you can find on the market. Let’s see its performance. The product comes in 2 pieces, including a soundbar that you will place on your desk and a subwoofer on the ground. It is quite straightforward to set up the system. 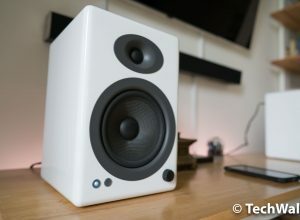 Since this is the passive subwoofer, it doesn’t need power and you will just need to connect a cord to the soundbar. 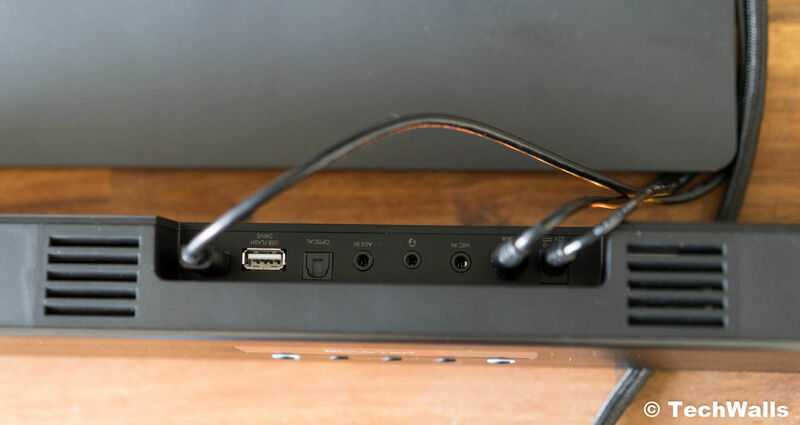 There are 3 cables coming out of the soundbar, which are the power cord, the subwoofer cord, and the USB cable connecting to your PC. It is not much but still can turn your table into a mess, so make sure to organize the cables neatly. I really hope that Creative will offer a wireless connection between the soundbar and the subwoofer in the next generation; In that case, the setup will look less cluttered and I will have more freedom in the subwoofer placement. I really hope that Creative will offer a wireless connection between the soundbar and the subwoofer in the next generation; In that case, the setup will look less cluttered and I will have more freedom in the subwoofer placement. At the moment, you can reduce the number of cords by connecting your PC/laptop to the soundbar via Bluetooth; Now, you would just need the power cord and subwoofer connected to the soundbar. The Katana doesn’t have an HDMI port, so it can’t connect to the HDMI ARC port on your TV. However, this is not really important since you can use other ports and the product target PC users. On the back, you can find all the essential ports like AUX-in, USB FlashDrive, Headphones out, USB Audio, Mic-in, and Optical-in. There is also a remote control but I don’t use it since the soundbar is always within my reach. All control buttons are placed on top, including the power/Bluetooth, volume up, volume down, source, and SBX button. The SBX button is used to switch among some preset audio profiles like neutral, gaming, concert, cinema, and night. 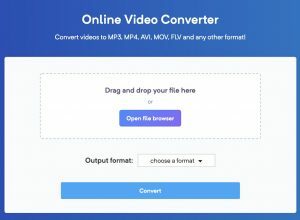 If you want to customize the sound further, you can install the Sound Blaster Connect software which is available on Windows only. It will allow you to adjust the EQ, immersion, crystallizer, smart volume, dialog +, and change the lighting. Lighting is one of the most interesting features of the soundbar. 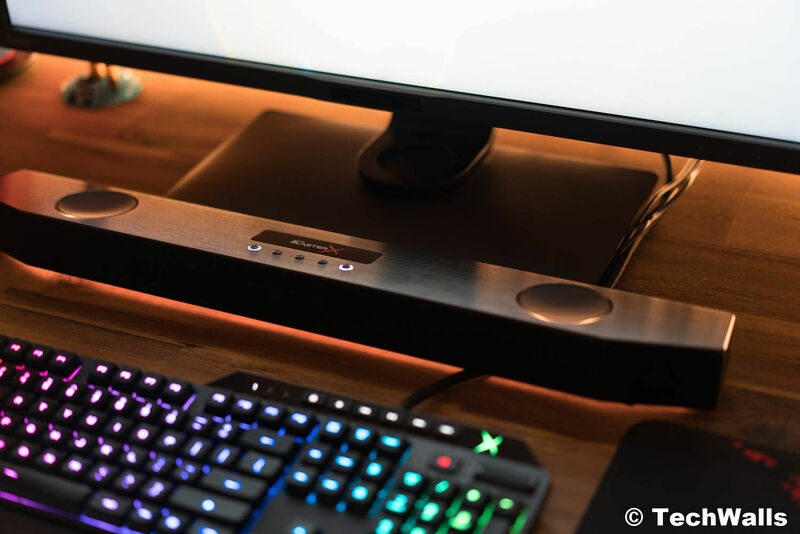 The 49 programmable LED lights run from edge to edge underneath the soundbar, they look really awesome when placing next to the keyboard and mouse with RGB lighting effects. 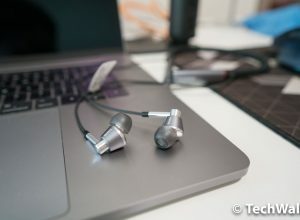 I expected a lot in the audio quality of the Katana since it has some promising features like high-res 24-bit audio, a tri-amplified design with a total output of 75RMS/150W peak power, and virtual 7.1 surround sound via USB connection. Undoubtedly, the soundbar is very powerful with a 5-driver design, including 2 up-firing midbass drivers, 2 high-excursion tweeters, and a long-throw subwoofer. Since I sit right in front of the soundbar, I often set the volume level pretty low at about 10-15 while the maximum is 50; I can’t imagine how loud the system would be if I cranked up the volume. In terms of sonic characteristics, I use the soundbar in Concert profile most of the time since the bass and treble are boosted significantly in this mode. However, the bass might be a little overwhelming, especially in a small room, and the high frequencies sometimes feel processed and unnatural. Therefore, I highly recommend you to use the Sound Blaster Connect software to adjust the EQ to be suitable for your taste. The feature I was excited to try out is the virtual 7.1 surround sound for gaming. The soundstage of the soundbar is quite amazing. Although all the drivers are placed in front of me, sometimes, I still have to mute and look around to hear if the sound really comes from the soundbar. The surround sound performance is definitely better than most 2.1 systems out there, however, it is still not as good as soundbars with physical satellite speakers. Therefore, professional gamers might still need a dedicated gaming headset to hear the footsteps and ambient environment clearly. Creative is trying to create an all-in-0ne product for both gamers and audiophiles. 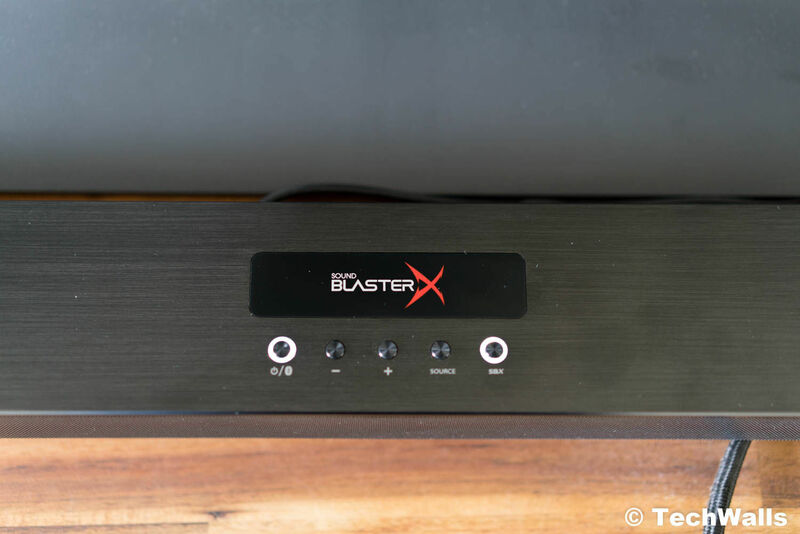 Although the Sound BlasterX Katana is not excellent in both of the categories, it still does a decent job and I believe many consumers will find a good use of it. Amateur gamers who play games for entertainment will also find the soundbar more than enough, and it is much more comfortable for your ears than wearing headphones. We at TechWalls recommend the product. A high-quality soundbar for gamers.